Jar Opener; Enablers, Elderly, Physically Impaired, Arthritis Sufferers. Flexible and ergonomically designed for minimal stress. 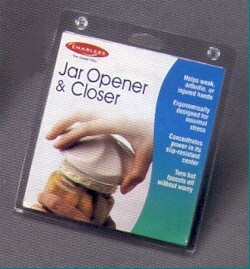 Helps weak, arthritic or injured hands to open and close jars. Concentrates power in its slip resistant center. Also turns on and off faucets.